Each family has many different shoes,Which is used for different forms of clothing, has different colors, styles and requires a lot of storage space. In some cases, for its off-season storage, not only the shoe boxes in the hallway are used, but sometimes they also allocate a part of the space of other living rooms and even a balcony. To solve storage problems, a shelf is needed forShoes, which will not only have a beautiful appearance, and fit into the overall interior, but also provide the necessary conditions for short-term and long-term storage. Such products can be made of different building materials and have different design options. In order to determine the choice of the shelf and to understand which product is necessary in your case, let's try to consider all types of these designs, their main differences and applications. Products of an open type when manufactured are notProvide for the presence of doors and all footwear is stored openly in free access. The main advantage of this type is the provision of free air access, which prevents moisture from accumulating and removing unpleasant odors. This storage option significantly saves usable space and allows us to provide the necessary storage conditions to ensure a long service life. However, this type of product has its drawbacks. Open product with Shelves Allows you to store only oftenUsed shoes and has a limited capacity. They are designed only for storing seasonal shoes, because if in the warm season next to summer shoes to store winter boots, then by winter they will cover with a thick layer of dust. Closed-type products look like an ordinary closet,A small chest of drawers or a massive curbstone with a seating position, which initially provides doors for hiding the interior from the general view. In such places, usually store shoes that are used rarely or not suitable for the season. The main positive aspect of such a productYou can consider the presence of doors that hide the insides and give the shelf the look of the finished product. In most cases, they have a minor internal space and are designed exclusively for long-term storage. Both types of designs can differ significantly in height - from 35 cm for storing slippers, ending with a height of more than a meter for storing high boots or massive winter footwear. Multilevel structures are able toFixing the internal shelves at different distances from each other, which allows you to divide the total space into several tiers depending on the height of the used footwear. On this various functional additions do not end, and today the furniture market presents to the buyer a huge number of unique design solutions and design ideas. Variants with one partition are almost not used because of the small capacity, but for an apartment or a house with a narrow hallway will be appropriate to save space. Models with two shelves are the mostA widespread view, because they represent a kind of golden mean between the occupied space and spaciousness. Often such models have a space of different heights, which allows you to simultaneously store high-heeled shoes and room slippers. 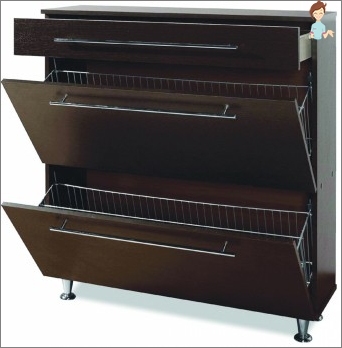 Shelves for shoes with three pull-out sections andMore, is usually made in the form of a cabinet or a banquet. Such products are mostly closed type and are not only a storage place, but also act as a decorative element of the entire interior of the hallway. Such designs are used for apartments and houses with a spacious hallway or a separate dressing room. All models can also be divided into types according to the type of material used. Products made of plastic are found quite often andAre purely functional in nature. 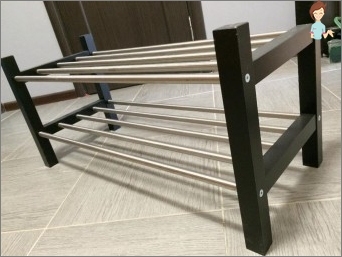 Plastic shoe shelf can have several tiers in the form of pallets, which are designed for drying wet shoes or for storing dirty shoes and shoes. Also, plastic designs are relevant in the winterThe time when snow on boots when placed in a warm environment begins to melt and flows into plastic pallets. However, such models are usually not flaunted because of the unsightly appearance and are used only at the time of drying. Products made of natural wood are made inOpen and closed options. Due to the physical properties of the wood, such shelves have only clean and dry shoes, and are also used as interior elements. Metal construction is considered the mostA common budget option and most often has the form of a frame structure with lattice racks and has the ability to disassemble and assemble. These models can be used as an insert in an existing cabinet or as a separate element of the interior. Shelves for shoes of metal constructionTreated with a special anti-corrosion material, which allows you to store and dry wet shoes. When buying this model, try to buy a shelf with a chrome surface, as this coating serves much longer than conventional paint. Models from MDF are very popular,Because these products are relatively inexpensive and have a huge number of different design options and design execution. However, the service life of such models is relatively small compared to metal or natural wood. There is also a huge numberCombined models in which several types of material are used simultaneously. For example, it may be a closed shelf, the frame of which is made of natural wood, metal shelves of lattice type are used as shelves, and the closing doors can be made of MDF with decorative plastic facades. Each design can also be classified by type of placement. Embedded models of shelves for shoes can haveUniversal design and used as an internal insert for the cabinet or as a separate element of the interior. The second variant of the shelves for shoes is often made rotating on a special stand. Before you buy a similar element for your apartment, you need to learn the main types of shelves, their advantages and disadvantages, which will significantly reduce the decision-making process.